Saturday marks the start of my 2010 racing season. Instead of driving to the valley to race skinny tires on snow-covered asphalt, I am heading east, to the little known town of Echo; Echo Red-to-Red. 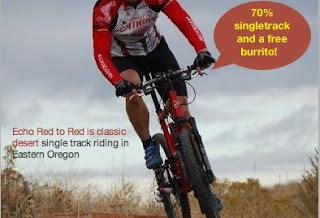 28 miles of single track along the Umatilla River; it’s supposed to be beautiful. Hopefully I can remember how to race a mountain bike. Or better put; hopefully I can figure out how to race a mountain bike. And with the start of racing season comes, you guessed it, RACE REPORTS! Fun to write, boring to read – but I am committed as ever to attempt to entertain with the ramblings and finer details of my 2010 racing season. And in other news: I am heading to Spain! Stay tuned for daily reports and photos from the island of Mallorca. Although I can’t promise Spanish Boots made of Spain Leather; let me know of any special requests (leave a comment below) and I will do my best to smuggle a few extra kilos of coffee and olive oil into my suitcase.